SEOUL, South Korea — The standoff over North Korea's nuclear program has long been shaped by the view that the United States has no viable military option to destroy it. Any attempt to do so, many say, would provoke a brutal counterattack against South Korea too bloody and damaging to risk. That remains a major constraint on the Trump administration's response even as North Korea's leader, Kim Jong Un, approaches his goal of a nuclear arsenal capable of striking the United States. On Tuesday, the North appeared to cross a new threshold, testing a weapon that it described as an intercontinental ballistic missile and that analysts said could potentially hit Alaska. Even the most limited strike risks staggering casualties, because North Korea could retaliate with the thousands of artillery pieces it has positioned along its border with the South. Though the arsenal is of limited range and could be destroyed in days, the U.S. defense secretary, Jim Mattis, recently warned that if North Korea used it, it "would be probably the worst kind of fighting in most people's lifetimes." Beyond that, there is no historical precedent for a military attack aimed at destroying a country's nuclear arsenal. The last time the United States is known to have seriously considered attacking the North was in 1994, more than a decade before its first nuclear test. The defense secretary at the time, William J. Perry, asked the Pentagon to prepare plans for a "surgical strike" on a nuclear reactor, but he backed off after concluding it would set off warfare that could leave hundreds of thousands dead. The stakes are even higher now. U.S. officials believe North Korea has built as many as a dozen nuclear bombs — perhaps many more — and can mount them on missiles capable of hitting much of Japan and South Korea. Earlier in his term, Trump tried to change the dynamics of the crisis by forcing the North and its main economic benefactor, China, to reconsider Washington's willingness to start a war. He spoke bluntly about the possibility of a "major, major conflict" on the Korean Peninsula, ordered warships into nearby waters and vowed to "solve" the nuclear problem. But Trump has backed off considerably in recent weeks, emphasizing efforts to pressure China to rein in Kim with sanctions instead. After all, a pre-emptive U.S. attack would very likely fail to wipe out North Korea's arsenal, because some of the North's facilities are deep in mountain caves or underground and many of its missiles are hidden on mobile launchers. The North has warned that it would immediately retaliate by launching nuclear missiles. But predicting how Kim would actually respond to a limited attack is an exercise in strategic game theory, with many analysts arguing that he would refrain from immediately going nuclear or using his stockpile of chemical and biological weapons to avoid provoking a nuclear response from the United States. Assuming Kim is rational and his primary goal is the preservation of his regime, he would only turn to such weapons if he needed to repel a full-scale invasion or felt a nuclear attack or other attempt on his life was imminent, these analysts say. But anticipating what the North might do with its conventional weapons in the opening hours and days after a U.S. attack is like trying to describe a "very complex game of three-dimensional chess in terms of tic-tac-toe," said Anthony H. Cordesman, a national security analyst at the Center for Strategic and International Studies in Washington. The problem, Cordesman said, is that there are many ways and reasons for each side to escalate the fighting once it begins. Stopping it would be much more difficult. 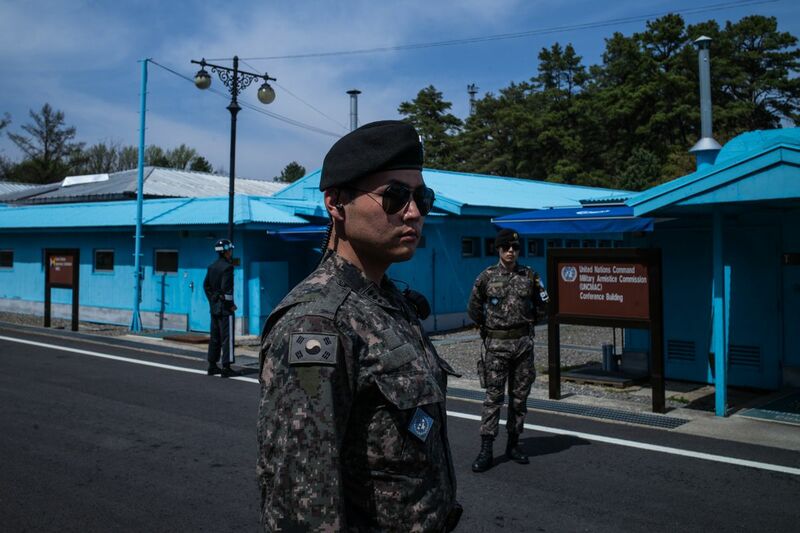 North and South Korea, separated by the world's most heavily armed border, have had more than half a century to prepare for a resumption of the war that was suspended in 1953. 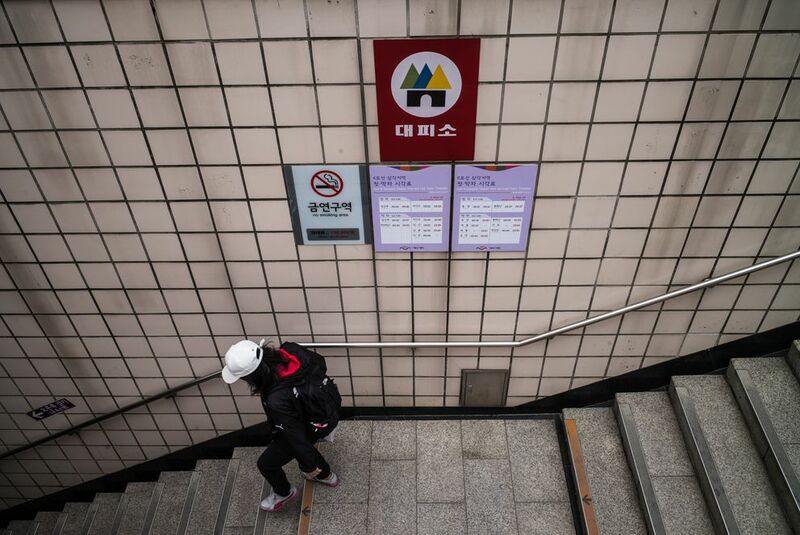 While the North's weaponry is less advanced, the South suffers a distinct geographical disadvantage: Nearly half its population lives within 50 miles of the Demilitarized Zone, including the 10 million people in Seoul, its capital. "You have this massive agglomeration of everything that is important in South Korea — government, business and the huge population — and all of it is in this gigantic megalopolis that starts 30 miles from the border and ends 70 miles from the border," said Robert E. Kelly, a professor of political science at Pusan National University in South Korea. "In terms of national security, it's just nuts." North Korea has positioned as many as 8,000 artillery cannons and rocket launchers on its side of the Demilitarized Zone, analysts say, an arsenal capable of raining up to 300,000 rounds on the South in the first hour of a counterattack. That means it can inflict tremendous damage without resorting to weapons of mass destruction. Kim could order a limited response, by hitting a base near the Demilitarized Zone, for example, and then pausing before doing more. But most analysts expect the North would escalate quickly if attacked, to inflict as much damage as possible in case the United States and South Korea were preparing an invasion. "North Korea knows it is the end game and will not go down without a fight," said Jeffrey W. Hornung of the RAND Corp., adding: "I think it is going to be a barrage." The North has often threatened to turn Seoul into a "sea of fire," but the vast majority of its artillery has a range of 3 to 6 miles and cannot reach the city, analysts say. The North has deployed at least three systems, though, that can reach the Seoul metropolitan area: Koksan 170 millimeter guns and 240 millimeter multiple-rocket launchers capable of hitting the northern suburbs and parts of the city, and 300 millimeter multiple-rocket launchers, which may be able to hit targets beyond Seoul. There are perhaps 1,000 such weapons near the Demilitarized Zone, many hidden in caves, tunnels and bunkers. But under a traditional artillery strategy, the North would not fire them all at once. Instead, it would hold some in reserve to avoid giving their positions away and to conserve munitions. How much damage an initial attack would inflict depends on how many are used and on how much of the ordnance explodes. In 2010, North Korean forces fired about 170 shells at an island in the South, killing two civilians and two soldiers. Analysts later concluded that about 25 percent of the North's shells failed to detonate. A study published by the Nautilus Institute for Security and Sustainability in 2012 concluded that the initial hours of an artillery barrage by the North focused on military targets would result in nearly 3,000 fatalities, while one targeting civilians would kill nearly 30,000 people. The North could compound the damage by also firing ballistic missiles at Seoul. But Joseph S. Bermudez Jr., a North Korea expert at AllSource Analysis, a defense intelligence consultancy, said it was more likely to use missiles to target military installations, including U.S. bases in Japan. U.S. and South Korean forces could be put on alert and bracing for retaliation before any attempt to knock out North Korea's nuclear program. But there is little they can do to defend Seoul against a barrage of artillery. The South can intercept some ballistic missiles, with the recently installed Terminal High Altitude Area Defense system, as well as Patriot and Hawk systems. But it does not have anything like Israel's Iron Dome that can destroy incoming artillery shells and rockets, which fly at lower altitudes. Instead, South Korean and American troops would employ traditional "counterbattery" tactics — using radar and other techniques to determine the location of the North's guns when they are moved out of their bunkers and fired, and then using rockets and airstrikes to knock them out. David Maxwell, associate director for the Center for Security Studies at Georgetown University and a veteran of five tours in South Korea with the U.S. Army, said the Pentagon was constantly upgrading its counterbattery capabilities. But he added, "There is no silver bullet solution that can defeat North Korean fire before they inflict significant damage on Seoul and South Korea." Based on counterbattery efforts in the Iraq War, the Nautilus Institute study estimates that North Korea might lose about 1 percent of its artillery every hour to American and South Korean counterbattery fire, or more than a fifth of its arsenal after a day of fighting. What makes the situation so dangerous is how easy it would be for either side to take action that leads the other to conclude an all-out war is imminent and escalate the battle. The United States and South Korea could hit targets besides artillery, including supply lines and communication facilities, for example. The North could send tanks and troops across the border and drop special forces into the South's ports. Especially perilous would be any hint that the United States and South Korea were preparing a "decapitation" strike against the North Korean leadership, which could lead a desperate Kim to turn to nuclear or biochemical weapons. All things considered, analysts say, it could take American and South Korean forces three to four days to overwhelm North Korea's artillery. How much damage North Korea inflicts in that time depends in part on South Korea's ability to get people to safety quickly. As more of the North's guns are destroyed and people take cover, the casualty rate would fall with each hour. But critics say local authorities are unprepared for the chaos an artillery attack would cause and that the public is nonchalant about the prospect of war. 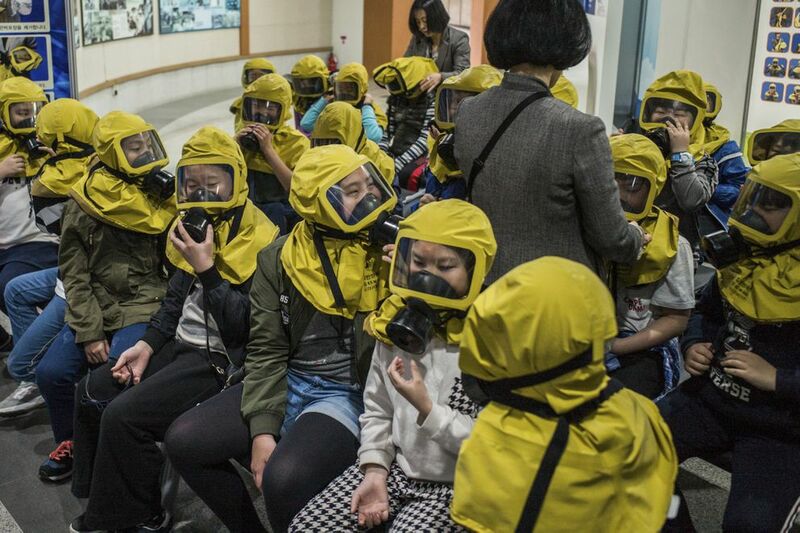 "For the first 72 hours," said Nam Kyung-pil, governor of Gyeonggi province, "each individual will have to save their own lives or be prepared by themselves."